PHILIP CARDINALE (drpjcardinale@gmail.com) is an intellectual property law attorney specializing in copyright law at Drinker Biddle & Reath LLP in Washington, DC. He holds a doctorate in English literature from Oxford University. JOSEPH CARDINALE (josephcardinale@hotmail.com) is a doctoral candidate in creative writing at the University of Hawaii (Manoa) and holds an MFA from the University of Massachusetts (Amherst). His book of creative fiction, The Size of the Universe, was published by FC2 in October 2010. 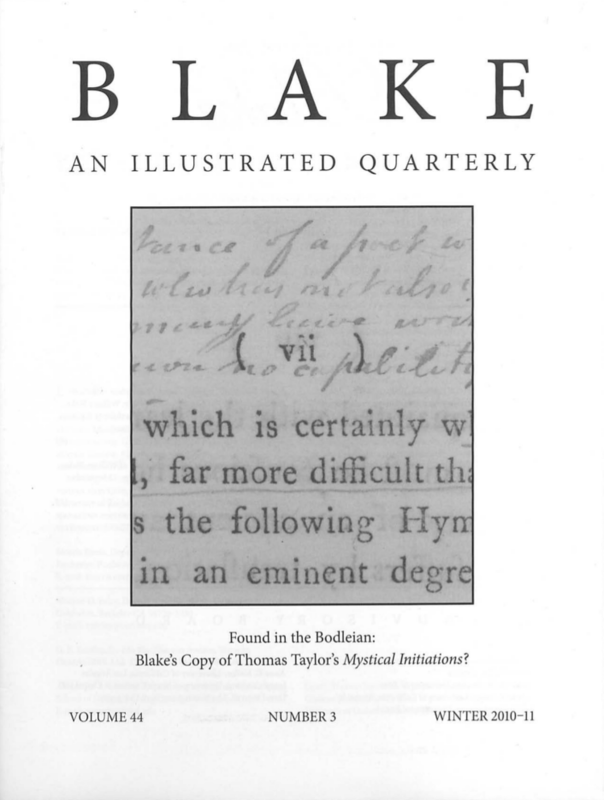 ROBERT N. ESSICK has been collecting and writing about Blake for over forty years. JAMES ROVIRA (jamesrovira@gmail.com) is assistant professor of English and program chair of Humanities at Tiffin University in Tiffin, Ohio. His monograph, Blake and Kierkegaard: Creation and Anxiety, is now available from the Continuum International Publishing Group. Please send submissions in electronic form, documented according to the MLA Style Manual, and with pages numbered, to either of the editors. Cover: Thomas Taylor, The Mystical Initiations; or, Hymns of Orpheus (London, 1787), detail of p. vii. The Bodleian Libraries, University of Oxford (Arch. H e.181).